Vivo is looking to kick-start 2017 with its new smartphone Vivo V5 plus. The official release of the Vivo v5 plus is scheduled on 23rd of January 2017. Before the official announcement the specifications of the Selfie, Centric Smartphone was found In an E-commerce website in Malaysia. The Vivo Company had launched the Vivo V5 smartphone in the last quarter of 2016. 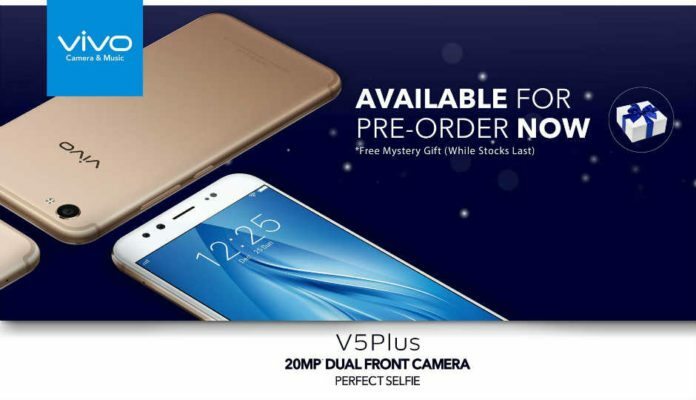 During the same event, the firm had teased about the higher version naming it as V5 Plus. Vivo achieved success with its latest release Vivo V5 and willing to repeat the same magic with its successor V5 Plus. Vivo V5 Review: Is that just a ‘Perfect Selfie’ Show? If the leaked details are to be believed the new Vivo v5 plus would be coming with a 5.5-inch Full HD display and with a 2.5D Corning Gorilla Glass. Vivo V5 Plus is built with a 4GB RAM along with the powerful 2GHz Octa-Core Snapdragon 625 Processor which enables multi-tasking at a good speed. The main highlight of this smartphone is its dual front camera setup that includes a 20MP front-facing camera with Moonlight Flash and a secondary 8MP camera at the front side. Vivo v5 Plus is also equipped with a 16 MP Camera at the rear end. Having powered by a 3160mAh battery, the smartphone also featured with a fast charging option.The Selfie-focused smartphone V5 Plus is priced at 1799 RM (US$ 402 / Rs. 27445 approx.) in Malaysia.